Curvy Barbie is here -- and petite Barbie, too! The most iconic doll in the world -- she's been in our hearts and in our homes since the late 1950s -- has made a few changes. Barbie's recent fall "Imagine the Possibilities" campaign went viral, but there has always been some negative connotation around the doll's unrealistic body proportions and the body-image impact this could have on young girls. Today, Mattel released three new body types for Barbie, in addition to the original: Petite, Tall and Curvy. Each is also available in different skin- and hair-color combinations, and also offer a flat-footed option (for those of us who don't spend our lives in heels!). 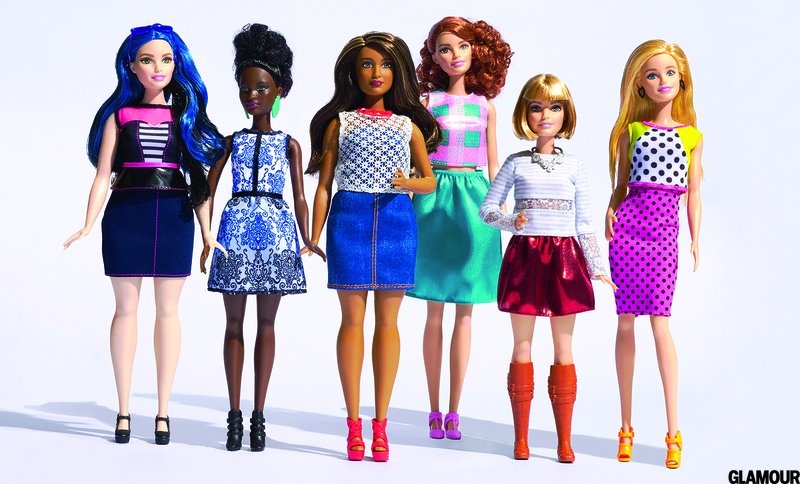 Our friends at Glamour debuted the dolls in an exclusive, speaking with the team behind Barbie. "Barbie was never designed to replicate the female body," insists Michelle Chidoni, head of communications for all things Barbie. "She was a vehicle for play." But her unrealistic shape has long dominated the conversation: The International Journal of Eating Disorders reports that the odds of being born with a Barbie-like body are less than 100,000 to 1; the doll's teeny-tiny waist would accommodate just half a liver and a few inches of intestine, experts say, and her überlong neck would wilt under the weight of her disproportionately huge head. Mattel realized they could likely attribute a 4-year sales slump to the fact that millennial parents associate a negative connotation with Barbie for this very reason -- and it was time to make a change if they wanted to bring Barbie back as a favorite for children. The relaunch was no small feat. The process of relaunching the doll was super secret and featured high-profile collaborators like American Ballet Theatre principal dancer Misty Copeland and award-winning documentarian Rory Kennedy (Ethel, Ghosts of Abu Ghraib), who produced a video about the making of the new dolls. "Will they change the world?" she says. "No. But it's relevant for little girls to see a doll that looks like them." We echo Glamour's feelings that of course, the dolls aren't perfect, but they're a pretty great start. There's nothing more powerful than showing young girls that who they are, how they look, and how they feel matters -- and one small way to encourage self-confidence and acceptance is to give them a doll that looks a little bit more like them. Because no child should feel that if she doesn't look like Barbie, she's not beautiful. Here's to the new Barbies, and continuing to empower young girls. Petite @Barbies tells my daughter her tiny friend is beautiful. Tall skinny barbie tells my daughter her super tall friend is pretty. Curvy Barbie? She represents the first institutional voice to ever tell me my body type is pretty *now*, not in some golden past. barbies teach young girls what's beautiful. so how about we be realistic? teach black girls to love their NATURAL hips. Re the new #Barbie sizes and shapes!Thank God every little girl won't think they're fat if they don't look like a Barbie Doll! 8 Super-Easy Steps for Looking Flawless--Fast!